She perches on the bathtub to teach them to hunt. 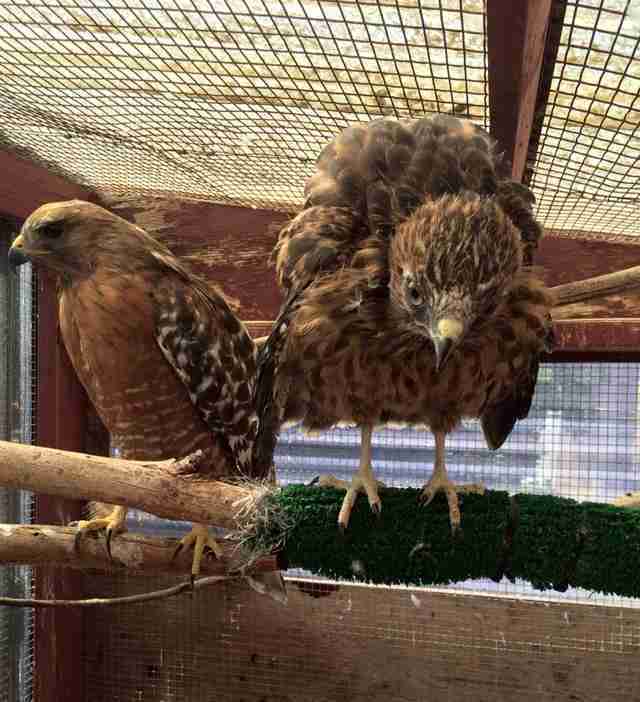 When a red-shouldered hawk now named Fiona was born, one of her wings was deformed — and she would never be able to fly. But perhaps Fiona was born to help others. 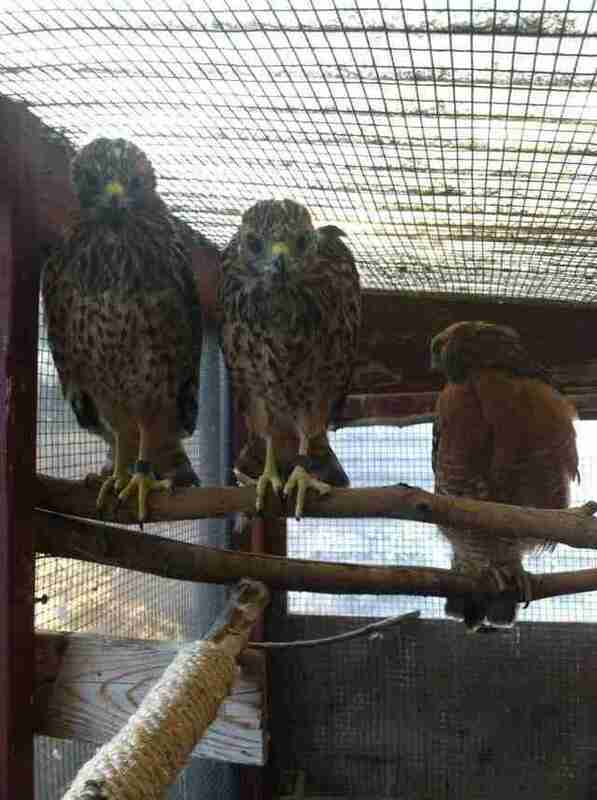 Back in 2007, the little flightless hawk arrived at Pacific Wildlife Care (PWC) in Morro Bay, California. "She was brought to Pacific Wildlife Care's wildlife center because she appeared to have a wing injury," Kelly Vandenheuvel, a wildlife rehabilitator who works with PWC, told The Dodo. "In fact, she was born with a disability — a deformed wing that prevented her from being able to fly at all." Vandenheuvel, who has been doing wildlife rehabilitation with PWC since 1983, also does educational talks about wildlife at schools and community events. At first people thought that since Fiona couldn't be released into the wild because of her injury, she would be able to work as a "wildlife ambassador" at these programs. But Fiona hated it. "She was not an ideal candidate due to her anxiety when put on a glove," Vandenheuvel said. A year passed. And even though Fiona lived in a large enclosure with ladders and ramps, she appeared to be lacking something. One day, Vandenheuvel found a few eggs on the ground in Fiona's enclosure. 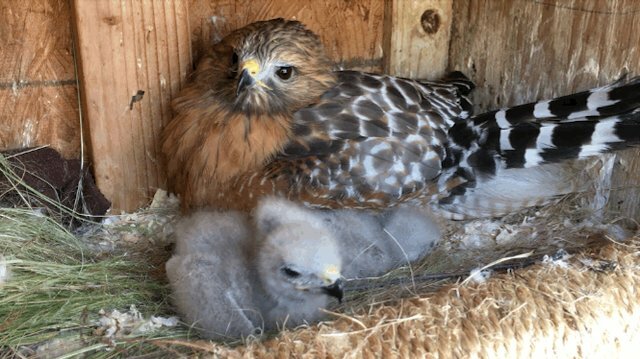 "I quickly set up a nest box so that she could sit un her infertile eggs thinking she was incubating them," Vandenheuvel said. Fiona seemed to enjoy it — but the eggs weren't fertilized, so no babies hatched. But then Vandenheuvel had an idea. She replaced the eggs with some baby chickens to see if Fiona would raise them. 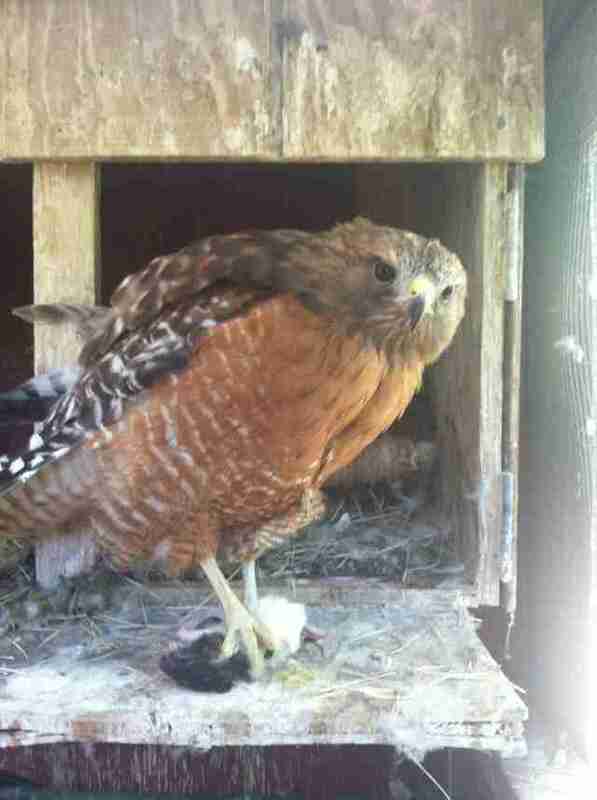 Sure enough, she loved raising babies — even if they weren't hawks like her. 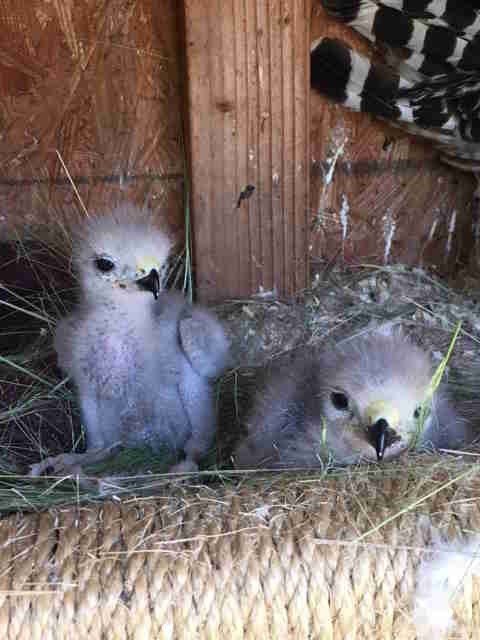 "She raised the little chicks, and fed them like her own," Vandenheuvel said. "We knew at that point she was going to be a great surrogate if she would raise chickens and not eat them!" Every year since then, Fiona has laid two infertile eggs, and Vandenheuvel replaces them with real babies who desperately need a mom. 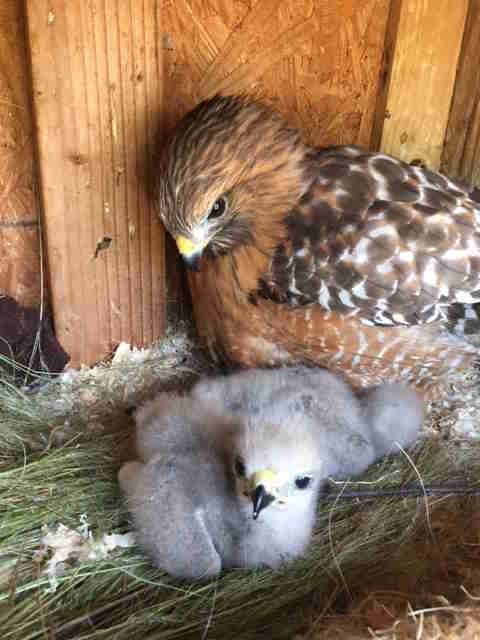 Fiona is raising two baby red-shouldered hawks right now, who were brought to the Ojai Raptor Center after they were found all alone, and transferred to the expert surrogate. "What I do each year when the babies are given to me, is slip them under Fiona just before it gets light in the morning," Vandenheuvel said. "I also take her eggs, and place baked egg shells under her so she thinks the babies hatched on their own once it is light, and she can see them." And Fiona doesn't discriminate. 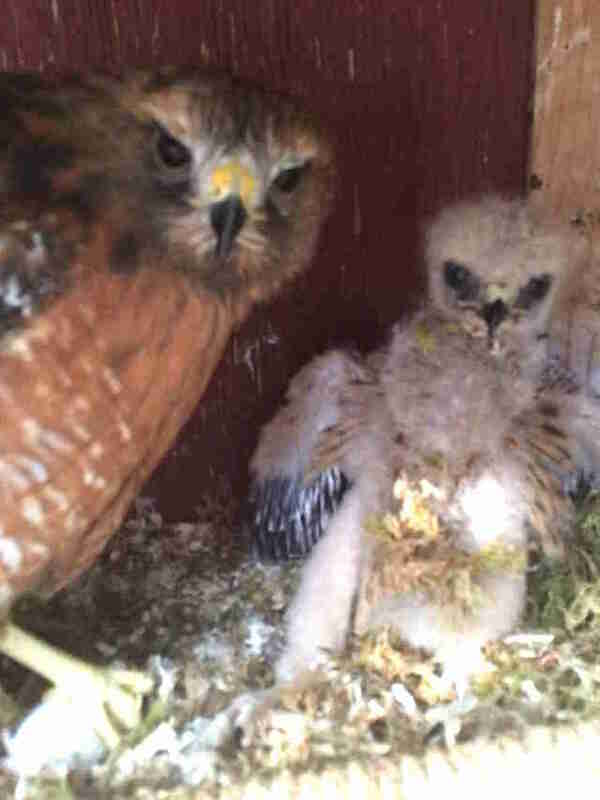 "One year I had a baby red-shouldered [hawk] given to me that was fully feathered," Vandenheuvel said. "She even took in that baby although she must have known it was much too big to be one she had hatched." 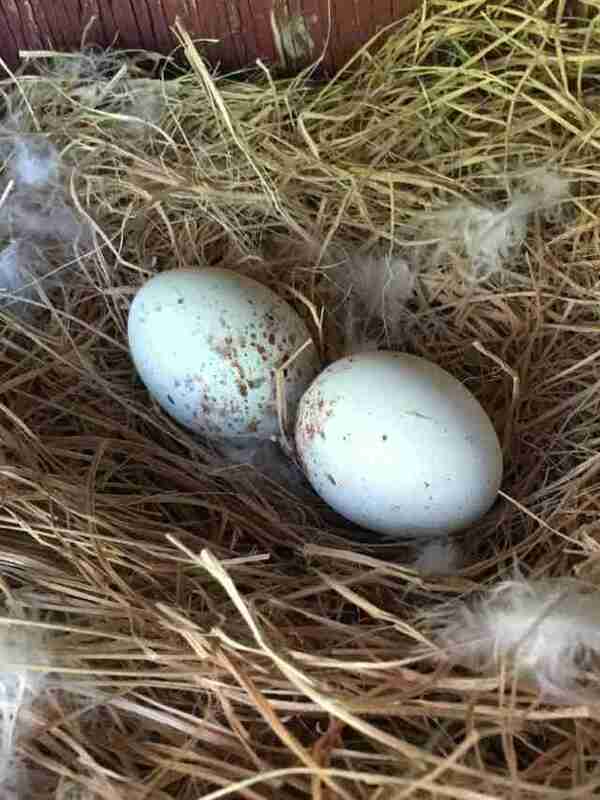 Last year, there were no orphans who needed raising at PWC, so Fiona, never one to give up, sat on her two eggs diligently for three whole months. 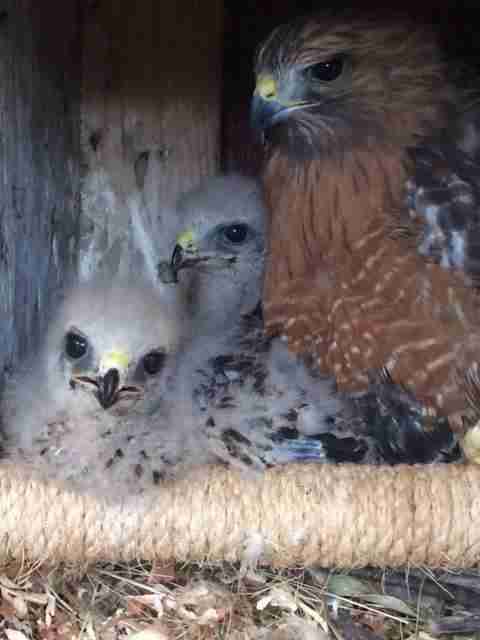 "I finally had to remove them and take her off her nest," Vandenheuvel said. "It was pretty sad." 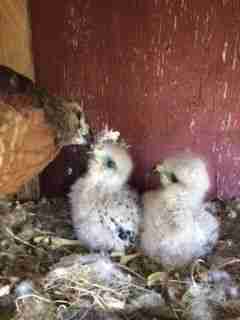 But this year, Fiona is lucky enough to have two needy chicks to feed and raise. Once they're a little bit bigger, they'll go with Fiona to an enclosure with an old bathtub where they can practice hunting. And Fiona doesn't let her disability prevent her from being with her adopted babies during this very important milestone. "Even though Fiona can not fly, she is able to jump up on the side of the tub, and launch herself in to catch the mice," Vandenheuvel said. "The babies catch on very quickly needless to say!" 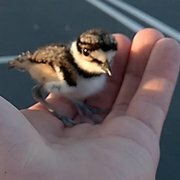 Once the babies are hunting on their own, it is time for a soft release. "I put Fiona back in her enclosure, and open a small release door," Vandenheuvel said. "This gives the babies the opportunity to come back to eat if they are not catching enough food in the wild at first." In total, Fiona has been a mom to 14 baby birds who needed one — including the baby chickens. To help people — and Fiona — save more baby birds, you can make a donation to PWC.